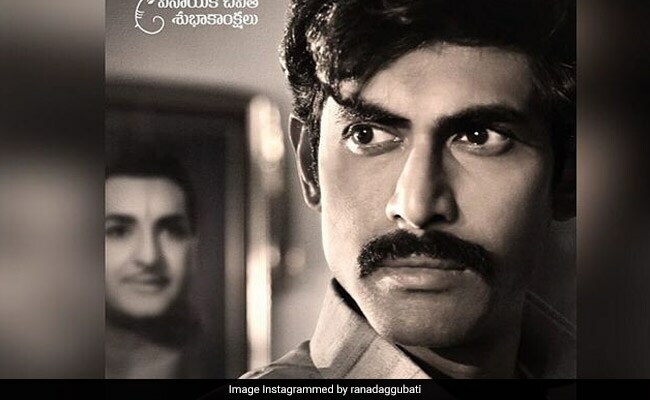 Rana Daggubati, who will play the role of Andhra Pradesh Chief Minister Chandrababu Naidu in the upcoming biopic on actor-politician Nandamuri Taraka Rama Rao (NTR), unveiled his first look poster on Wednesday. Directed by Krish Jagarlamudi, the untitled biopic is one of the most anticipated films of 2019. Rana shared a monochrome poster featuring himself as the Andhra Pradesh Chief Minister. The 33-year-old actor appears to have shed some kilos for his look in the film. Rana's look in the poster is in parity with a much younger version of the politician. In the background we can also spot a framed portrait of NTR. Rana shared the poster on social media and captioned: "Shri N Chandrababu Naidu 1984." Chandrababu Naidu is the son-in-law of N T Rama Rao. Chandrababu married NTR's daughter Bhuvaneswari in 1980. Previously, Rana Daggubati teased fans with a monochrome photo of an empty assembly. The focus of the photo was on the name Chandrababu Naidu. On Independence Day, the makers of the biopic dropped the first poster of the film featuring Nandamuri Balakrishna, who will play the role of his father NTR in the biopic. In the poster, Balakrishna can be seen dressed in a saffron kurta. Besides Nandamuri Balakrishna and Rana Daggubati, the film also stars Vidya Balan, who will be seen playing the role of NTR's wife Basavatarakam. Actor Jisshu Sengupta is also part of the anticipated biopic, where he will feature as producer L V Prasad. Several unconfirmed reports also stated that Rakul Preet Singh will play the role of Sridevi in the film. The film went on floors in March this year. Vice President M Venkaiah Naidu was also present at the launch of the film in Hyderabad. The biopic is expected to release next year.